Abstract : We explore the connection between fluid capture, simulation and proximal methods, a class of algorithms commonly used for inverse problems in image processing and computer vision. Our key finding is that the proximal operator constraining fluid velocities to be divergence-free is directly equivalent to the pressure-projection methods commonly used in incompressible flow solvers. This observation lets us treat the inverse problem of fluid tracking as a constrained flow problem all while working in an efficient, modular framework. 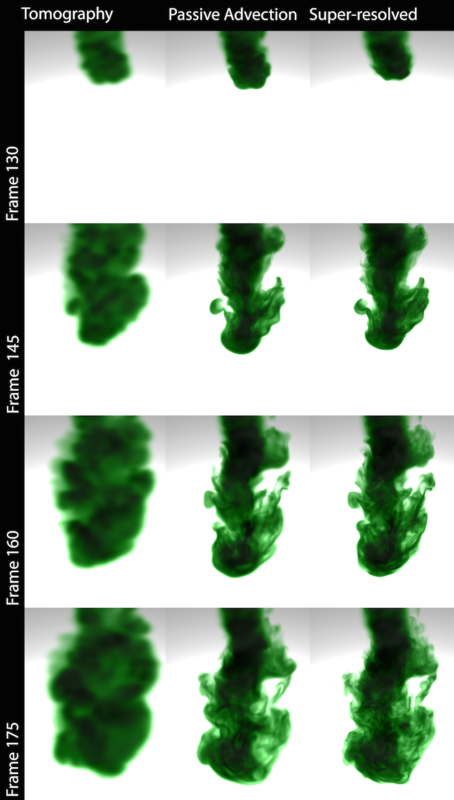 In addition it lets us tightly couple fluid simulation into flow tracking, providing a global prior that significantly increases tracking accuracy and temporal coherence as compared to previous techniques. We demonstrate how we can use these improved results for a variety of applications, such as re-simulation, detail enhancement, and domain modification. We furthermore give an outlook of the applications beyond fluid tracking that our proximal operator framework could enable by exploring the connection of deblurring and fluid guiding.